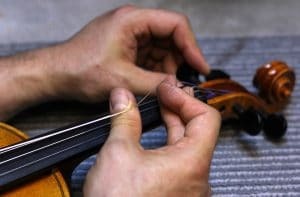 If you have already learned how to tune your violin by reading this article, you should also get familiar with the process of changing its strings. Because, at first, this task might seem overly complicated, we have decided to help you out by putting together a step-by-step guide that you are likely to find practical. The first thing that you have to do in order to change the strings on your violin is to remove the old ones. To do so, you have to loosen them by turning the peg in the correct direction and to simply pull them out of the hole in the tuning peg. Next, take the time to unhook the other end that is connected to the fine tuner. 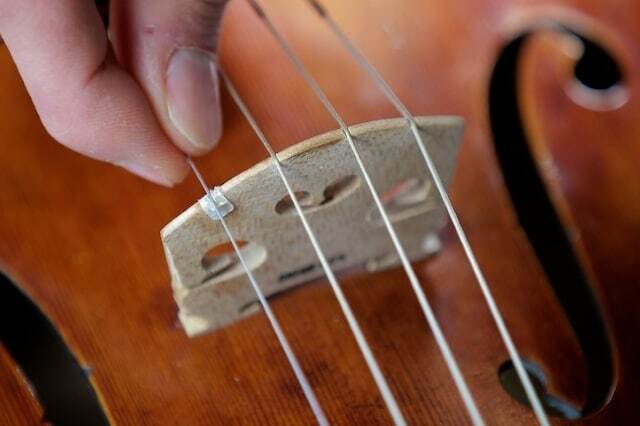 If your violin does not contain a fine tuner, simply unhook the strings from the tailpiece. To avoid any accidents that might result in the bridge, the tailpiece or the sound post to fall off, it is recommended that you only take one string off at a time. Once you are all done, place the ball-less end of the string inside the hole in the tuning peg. When doing so, push it all the way through so that a part that measures around 0.8 inches sticks out on the other side. This end then has to be bent back so that the string is safely connected to the hole. The strings should not come out easily. Furthermore, you have to place the ball end of the string inside the fine tuner or inside the hole that you can find in the tailpiece. Now, it is time that you verify that the string is placed in the proper notch in the bridge and inside the nut. The moment you are sure that all is well, you can proceed to tighten the string by using the tuning peg. You should tighten it until it is at the correct pitch. Repeat the process for the rest of the strings. However, keep in mind that some experts advise in favor of waiting a day until changing another string. Due to the pressure caused by the process of tightening the new strings with the tuning pegs, there is a high chance that the bridge will start to lean towards the fingerboard. If this happens, you should gently pull the top in the same direction as the tailpiece. Once you are done doing so, go ahead and tune the new strings. After you have finished tuning the strings, it is best that you stretch them back and forth vigorously. Next, tune them again as they are likely to have gone flat. This happens because they have stretched. You should repeat this process until the new strings stop stretching. Now, your instrument will stay in tune for a longer time. If you have carefully followed our instructions, your violin should have brand new strings installed on it. Therefore, this is the moment when you should test it out! So, don’t waste any time and give it a go, you will certainly not regret it! Before you try to change the strings on your beloved instrument, it is vital that you make sure that your violin is in good shape. Therefore, you should check if the pegs are not wrapped or drilled too small or too big. Also, if you run into problems while attempting to change the strings, it is best that you take the instrument to the local shop and that you ask for specialized help. Buy the correct strings. A novice mistake that you might make is investing in the wrong strings. To avoid such issues, it is best that you carefully read the description of the product that you want to purchase. Plus, you should know whether or not your instrument requires the highest string to be loop or ball. As we have mentioned previously, it is advisable that you do not try to remove more than one string at a time. This is important because, according to the experts, in the case of basses, cellos, and violas, there should never be less than three strings on the instrument at a time. When this occurs, there is a chance that the bridge and/or the sound post might fall off. Even more so, you should pay extra attention to the entire process so that you don’t end up winding the strings in the wrong way. In fact, you should keep in mind that, at all times, the string should always wrap over the peg, and not around it. This is important because this position reduces the possible friction. 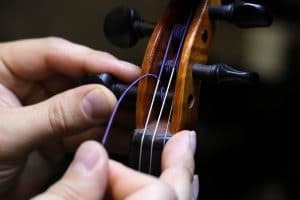 You should not overtighten the strings by tuning them over the pitch that they are meant to be tuned to. By doing so, you risk jeopardizing your violin and the integrity of the new strings. Also, you should never throw away the old strings as they can be regarded as a great backup to have, especially given that they are already stretched. A good way to save them is to place them in a string envelope and to mark the date when you removed them. This way, you know just how much you used them. Lastly, many violin players recommend that you always clean your instrument and that, when given the opportunity, you change certain parts. Hence, you can be certain that it won’t break unexpectedly. We feel that it is crucial that we point out that any work done on an instrument such as a violin requires a minimum level of experience. Because of this, it is best that you first attempt to change the strings of your prized violin under the supervision of a trained individual.